I was glad I persisted in my search for a reasonably priced ristorante in Bergamo’s Città Alta, and not restricted my search to the new town, otherwise I would have missed out on Il Circolino. 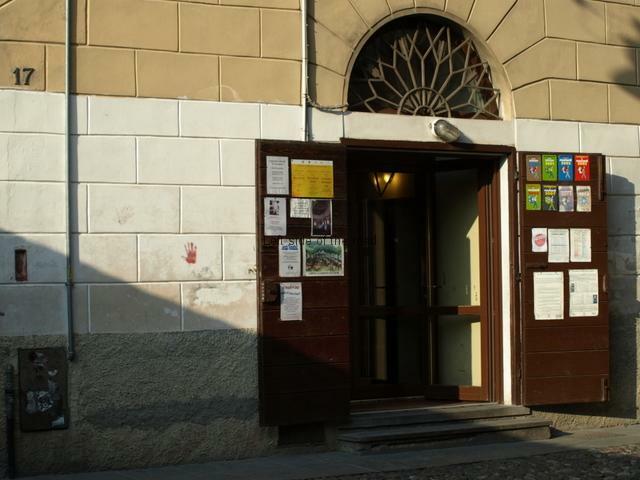 This is the restaurant within the building run by the Cooperativa di Città Alta, to be found in the dead-end alley off Via Colleoni (opposite No 22) with the Cooperative’s sign on the corner. It wasn’t till I was back home and did a bit more research that I realised I’d missed a few things during my lunch time visit – that’s the problem when you put together a programme, some things might just be missed out due to ignorance or time constraints. The Cooperative was started back in 1981 to counter a trend which local people could see developing with increased tourism. Some might profit from the hoards of people with money to burn, and the general price inflation that normally accompanies such, but what about the local people who had lived there before tourism was so important and weren’t on the receiving end of this new income? Although invited to sit outside (it was quite a pleasant day on my visit) I chose to eat inside, not least because you get a better idea of how the place is run when able to see the staff dealing with the customers. I decided on this place based upon the menu posted in the information case situated to the left of the main entrance. This had the options for the day including a ‘il menu prezzo fisso’ of €14. For this you were able to choose one starter and one main from the 3 options that were highlighted in each category. On top of that you had bread and water, a drink (wine or beer) and a coffee to finish. For the pasta course I chose the Casoncelli della Bergamasca (meat filled ravioli, garnished with bits of bacon and drizzled with butter). These were both tasty and filling and it was good to be able to try one of the local specialties. I don’t drink water but asked for a glass of red wine. This was a very good wine which came in a large glass but (unfortunately) not filled to the brim, in fact the brim was a long way from the surface of the wine. This is one of the problems of the Città Alta, all the booze suffers from a massive mark up, even in a place that was established to counter this hyper inflation. Fortunately it was a good local wine, rich and with plenty of taste, so perhaps what I lost in quantity I made up for in quality – perhaps too much of a pleb to be a wine connoisseur. For the main course I chose the salmon – I know I had that a couple of days before in the Autogrill but didn’t want more meat and had limited choice. But I was glad that I did go for the fish. There were two reasonably sized salmon steaks, which had been grilled and then served with a sauce of capers, cherry tomatoes and black olives then the whole lot sprinkled with ground cinnamon. This was a combination of flavours I hadn’t come across before and the contrast between the sweet and the sour really worked. This time there was no vegetable accompaniment. Both the dishes arrived hot so not a put off for some British travellers. And that was adequate for what I wanted. Not too much but at the same time I wasn’t left wanting for more. At the price I think I would have been in that situation if I’d gone into the other places off the Vias Gombito or Colleoni. Some places offer a ‘reduced’ menu but that seemed to mean pared down to the bone and they didn’t appeal to me at all. The coffee was the spoonful of caffeine in a tiny cup that’s the standard in Italian cafés. I’m not really a coffee drinker so didn’t bother to see if the coffee came in another format. I had arrived just after 12.30 thinking that things might get a bit busy after 13.00 but that wasn’t the case. From what I could make out I was the only non-Italian eating in the large dinning room. A couple of tables had small groups of building workers and one table had a group of 8 or so, apart from that there were only a handful of singletons. As the arms of the clock approached 14.00 the waiters started to clear the tables of the glasses and the packets which contained the cutlery and serviette so I got the impression that the lunch time was really only from about 12.00 to 14.00. Considering the location (just off the main street of the Città Alta) I thought this ristorante good value for money and I can’t say anything but good about the quality of what I was served. This is place I would return to on any future visit and have no qualms in recommending it to others. I learnt more of the history of the location after having been there so at the time I didn’t realise at what I was looking. The building had started life as a monastery, then was converted into a prison from the time of the French Napoleonic invasion and maintained that role until relatively recently. If I had known then what I know now I wouldn’t have rushed away and would have explored the garden and looked for the frescoes from the time it was a religious building. 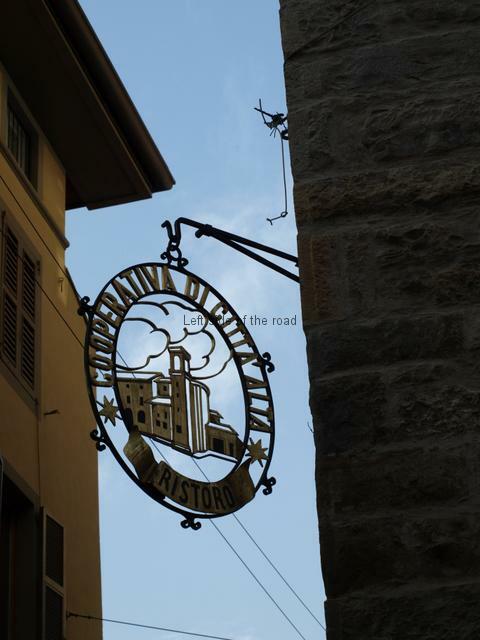 If you think of going to Il Circolino Ristorante it would be well worth checking out the website of the Cooperativa di Città Alta. In that way you might get a bit more out of the visit than I did. For lunch on my first full day in Bergamo (out of three) I decided to travel down into the new town and see what was on offer there. It gave me a chance to have another look at the Monument to the Partisan and, perhaps, take some pictures of the Città Alta from below – that didn’t work out well as the day was, and remained, overcast with even a dramatic thunder and lightning show accompanying torrential rain in the evening. Just as the bus approached the Porta Nuova junction, my planned alighting place, I noticed a sign for the Autogrill Self-service restaurant on the left hand side. It’s not that it’s hidden, there are big signs everywhere, including around the open air terrace on the first floor (not used the day I was there as it was a bit cool) but when you go through the door you have to go up a relatively narrow staircase and it appears you’re going into an office building rather than a restaurant. However, at the top of the stairs there’s an extensive menu, as well as the first part of the self-service – the trays. There’s a beauty of self-service restaurants in a foreign country in that you can get by without understanding the language, that’s if you choose with your eyes and are prepared to experiment. The down side is that they can often offer down market but I don’t think that was the case here. I arrived before 13.00 when most restaurants would start to get busy as the normal lunch time for workers tends to be between 13.00 and 14.00. Arriving early meant it was possible to take in all that was on offer, going back and forth, without creating too much havoc. I was in Italy so the first section, and the only one that was offering hot food being prepared as you wait, was the pasta and risotto section. The risotto was being prepared in a pan and was advertised with pesto so thought that would be a good choice. When I requested the risotto I was asked a question – that’s always the problem when you are weak in a language, however much you prepare there will always be a question you had not taken into account. The questions was ‘Bis?’. I didn’t have a clue what it meant until I’d answered a couple of more questions with a ‘Si’. ‘Bis’ basically means half and half – i.e., half risotto and half pasta (of a choice of two). And that turned out to be quite a substantial plate in itself, especially when this was supposed to be a starter. So on a reasonably large oval dish I had a portion of risotto with pesto and king prawns together with spaghetti with a meat and black olive sauce topped with a generous scattering of grated Parmesan cheese. (I thought it was a no-no to have Parmesan cheese with seafood but obviously no one had told the woman serving the food nor the young man who was in the queue in front of me.) The cost? €5.70. There was a salad bar but I’m not really into salads but what was on offer looked fresh and it was up to you to choose the number of the combination and the size of the portion, the price of all clearly marked up. There was a small dessert counter and they looked good so I went for a tart I hadn’t seen before, Torta della Nonna (Grandma’s tart) which was a custard in a pastry base topped with chopped almonds. (There are a lot of almonds in Italian cookery but now, more than likely, they come from California. This has led to the destruction of many thousands of almond trees in Europe as a consequence of cheap imports but with the present drought in California that supply might be under threat and with no alternative close to home the price of almonds might be set to rocket.) Also on offer was cheesecake and fruit. The cost of my tart? €2.70. To drink I chose a half bottle of of Chinati. One of the big downsides of eating in the Città Alta is the huge mark up on booze and didn’t think that the €4.20 for what was a quite pleasant and full-bodied wine was too excessive and, after all, May 7th was the 60th anniversary of the victory of the Vietnamese over the French at Dien Bien Phu so anything less would have been an insult on such an auspicious day. I was just about to pay when I saw that the person in front had gone for the salmon, so I went out of the queue to do the same, in the process almost doubling my bill. Salmon with potatoes cost €8.90 but it, again, was a substantial dish. Both the fish and the potatoes (dauphinoise) were cold and that might be a problem for some Brits as, over the years, I’ve met many who consider that food should always be piping hot. If you’re one of them then this place might not be for you – if you want to go for the main meals. That came to a grand total of €21.50, more than I was thinking of paying, but truthfully that would have been at the bottom end of the prices for any meal in the Città Alta and I don’t think I would have had half the quantity, whatever the quality might have been. I had a bit of a struggle, I wasn’t going to waste it, but I had to take my time. There was no pressure as it’s a large place and I wasn’t taking up a potentially valuable table. On the other hand no museums or the like would be open again until 15.00 and I’d been walking around for more than three hours in the morning. It also gave me an opportunity to people watch, as the overwhelming majority of the other customers were local people on their lunch break from work or college. The decoration was exactly what you’d expect of such a ‘workers canteen’ but clean and things that people didn’t take to the tray stands were collected as soon as they built up. Not as plush as some of the places in Città Alta but then there you’re often paying for the linen tablecloths and napkins, as well as the supercilious waiting staff, more than for the food. I had learnt years ago that Italians go into a bar, drink, pay and leave much quicker than is the norm in other countries and as I sat taking my time over my meal it was confirmed that they have that same attitude to food, at least in a public place at lunchtime, tables close to me filling up and emptying a number of times during my stay. Watching what other people were eating I was also able to learn, something I hadn’t picked up when selecting my food, that the restaurant takes orders for full 10/12 inch pizzas, which get cooked to order and then brought to the table – so that’s another option at the Autogrill. This was a good find and I wouldn’t have a qualms going to this place if I were to find myself hungry in Bergamo in the future. 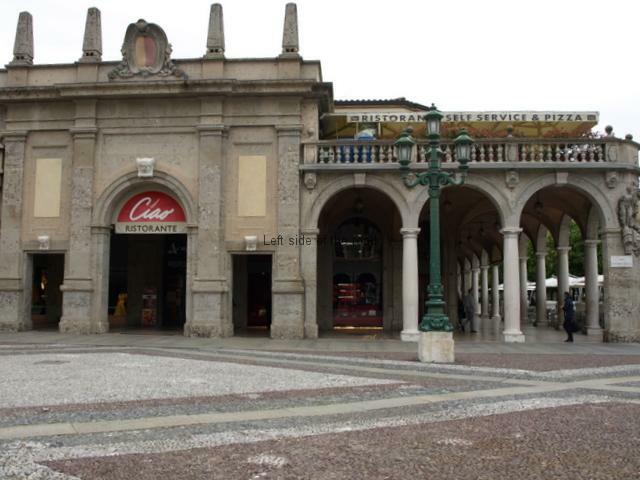 This is the big square close to the Porta Nuova and the restaurant is across the road from the Torre dei Caduti, on the edge of the town’s banking district. 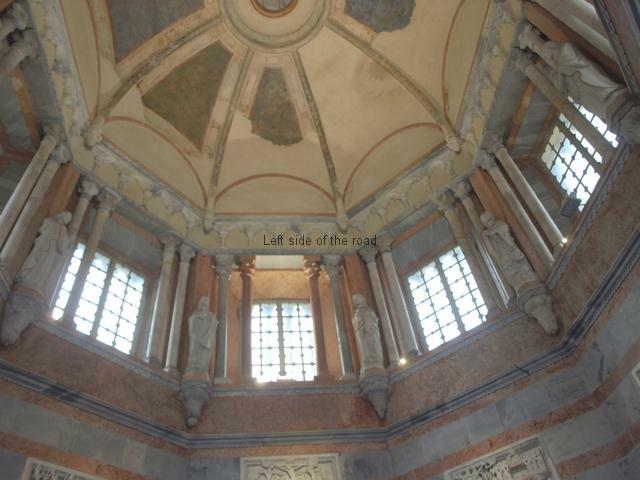 The Baptistery in Piazza Duomo, Città Alta, Bergamo must be the most peripatetic Baptistery in the world. It might not have travelled far but it moved often. Starting out inside the Basilica of Santa Maria Maggiore it was moved to two other places in the vicinity of the Piazza Duomo before ending up in its present location at the end of the 19th century. It was designed in the 14th century by Giovanni da Campione. He was also commissioned to build the porch over the two, north and south, entrances to the Basilica as well as the ‘side’ entrance tucked away in a corner to the left of the red lions holding up the north porch. 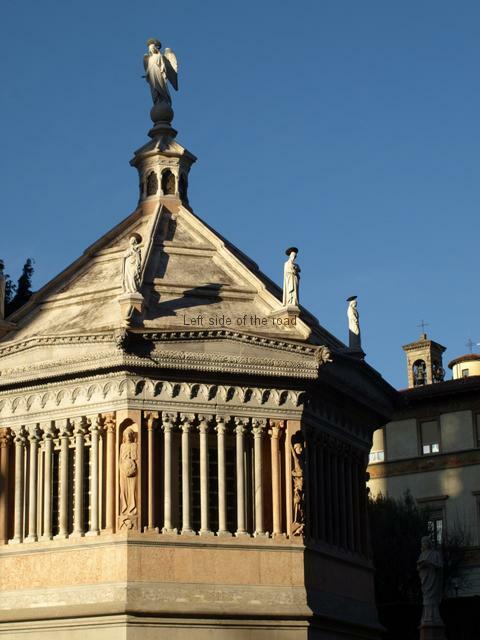 I found it difficult to find out very much about Campione as the majority of work attributed to him seems to be connected to the already mentioned structures in Bergamo. It seems that all his efforts there took place in the period, roughly, between 1420 and the late 1460s. Where he came from, when he was born, where he went afterwards and when he died is still a mystery to me. The Basilica lost its status as the baptismal church once the Cathedral was completed and that prompted the first move, out into the cold of the courtyard where it remained for a couple of hundred years before making its next couple of journeys. It’s difficult to see the thinking of Campione in designing such a large structure to place inside the even larger Santa Maria Maggiore as it must have looked out-of-place from the start. Not only did he design the octagonal building, the statues on the outside (representing the Three Theological Virtues – Faith, Hope and Charity; the Four Cardinal Virtues, Temperance, Justice, Prudence and Fortitude; with the addition of Patience to make the eight to fill the available niches) he created the marble bas-reliefs and statues inside as well as the font. 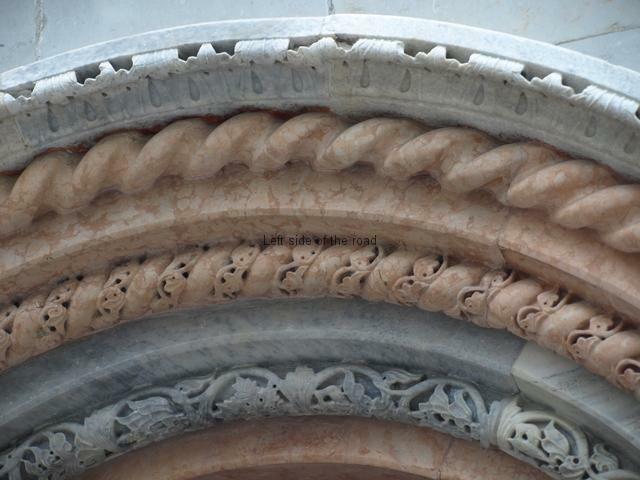 Considering its age and the number of times it has been moved it’s in a remarkably good condition, as can be witnessed by the intricate carved marble on the entrance arch. Normally the building is not accessible unless being used for actual baptisms – when the private nature of the function means that visiting is not really on the cards. However, in my visit to Bergamo in May 2014 there seemed to be crowds of either Italian school children or pensioners going inside on private, guided visits almost every time I passed by. During the first I came across, a school visit by primary children, I was able to get inside and have a look, quickly taking some pictures before the guide had the chance to break off from her talk to the children and throw me out. Unfortunately unless you are bare-faced and opportunistic there seems to be little opportunity to get a close-up look at Campione’s craftsmanship. The colours inside, not unsurprisingly, mirror those on the outside. As well as a statue of John the Baptist, standing facing the font and the entrance under a bas-relief of The Crucifixion, there are seven other bas-reliefs in marble depicting the normal story of Christ from pre-conception to death. The Piazza Duomo has grand buildings on all sides and the Baptistery is very much the smallest but it seems to fit into its present location and now looks as if it belongs where it took more than 500 years to arrive.